Anna & Devin knew they were destined to be together from the beginning after discovering that they both had photography degrees, so it made sense for them to start a business together—Boone Photo Booth. Anna worked alongside a photographer for many years here in the Boone, NC area before going out on her own. Boone Photo Booth was started because they felt as though this was something that was lacking in our area. They wanted to create a unique and fun experience for weddings and other events here in the High Country that left a lasting impression on people. Your wedding only happens for one day so why not make it as much fun as possible. I mean, it is a celebration and this gets the party going at the reception! People of all ages will love acting straight up silly and collecting photo strips from the event. It’s a great way to capture the quirky personalities of your guests and makes for a great memento to take home that will last a lifetime. I’m excited to share this behind-the-scenes interview about how and why Boone Photo Booth got started. I want to showcase passionate professionals in the wedding industry that help bring the day of your dreams to life. There are real people behind these businesses and I want you to get a glimpse of how they got started and why they do what they do. I hope you enjoy this behind-the-scenes interview series. I’m so excited to spotlight these High Country Creators. How did you get your start here in the High Country? I studied under John Scarlata at Appalachian State, and got my Bachelors degree in Technical Photography, with a minor in Media Studies in 2004. Devin attended Randolph Community college and graduated with a Photojournalism degree. We met at a music festival and immediately connected and fell in love. We learned of each others past and knew we were destined to live our lives together and create art. Devin has taken over his family’s business, Carolina Farm Table, and together we create photographic stories through wedding photography and our newest venture, Boone Photo Booth. I had been working alongside Boone wedding and portrait photographer, Jonathan Burton, for about 7 years, when we decided it was time to go out on my own and move closer to Devin’s work in Sparta, NC. Jefferson was a perfect spot we felt to begin our family and start our own photography business, officially. I love working with area brides and vendors and feel blessed to be able to call this area home. We were inspired to start Boone Photo Booth out of a necessity that our beloved High Country had been lacking, a unique and fun photo booth experience for local and destination wedding couples and their guests, as well as High Country businesses and families. We really felt from the beginning that if we were going to bring a photo booth to the area, it needed to be up to our high-quality standards photographically, and have fun unique vintage props. I wanted a big booth, large enough for wedding parties to physically fit into. It needed to be done right if we were to do it. Why did you decide to get involved with the wedding industry? I love working alongside other vendors to make a bride and grooms’ dreams come true. Your wedding day is one, if not the single most, important day of your life. I want to help make it not only the most memorable, but the most fun too for their wedding party and guests. Life is short and parties are even shorter! We need more fun and silliness in our lives! What is your favorite part of the whole process? My favorite part of the whole process is seeing everyone’s reactions to themselves and their photos. I love that everyone enjoys the booth, no matter your age, 1-100. People can express themselves in the booth and leave their insecurities outside. Dressing up in our fun, vintage, and whimsical props allow alternate personas to bubble out of folks and they can just let go! Also, I love that it is instant gratification, right there during your event! Our photo strips are all customized depending on your event and they create a great memento that folks can take home and enjoy later. What is your biggest challenge in preparing for a wedding day? How do you think a photo booth can be used to tell a unique wedding story? Boone Photo Booth can be used to tell a unique wedding story because it truly captures the personalities of the wedding party and guests. People are open to the idea of going into a closed, fully automated booth for their portraits. Since we provide a disk of all the images after the event, the couple can choose to add these to their album that their photographer has created for them. This makes the photographer’s job a little easier. 😉 Another option we offer is a custom guest book with photo strips and your guests’ well wishes next to their photo strip. This is so much fun and a unique way to incorporate your story to look back on. How did you tell your story through your wedding? Our wedding was definitely one of a kind, and all about involving our friends. My best friend crafted my wedding dress, which we designed together. Our great friends at the Gamekeeper restaurant commissioned Devin to build a hutch in trade for the reception space Saturday night. Our buddy Brian Swenk, who introduced us, was nice enough to bring his band for entertainment. And lastly, our friends and family helped us literally build an arbor and arranged all the flowers and decor, making it all come together. Having a support group like we did is essential. If you had it to do all over again, would there be anything you’d change about your wedding day? Why or why not? It was a great time with great friends, but we didn’t have a “formals” list when it came to the photography. I wish we would have spent more time planning the pre and post-ceremony time and had a list of must have family and friends photos. What one piece of advice would you give to a couple getting married? Obviously, you pay for what you get. Photography should be #1 on your wedding radar and if you are going to splurge on anything, this should be it. Photography is all you will have 10, 20, 30 years from now of your wedding and it is essential! Prints from the actual photos go along with this in my opinion… But don’t get me started, haha.. If you could have written a letter to your future bride-self to read on your wedding day, what would the note have said? 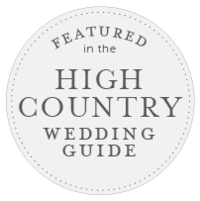 What are some of your favorite wedding vendors located in the High Country? There are so many amazing and talented people here in the High Country! A few of my favorites are Camp Sky Ranch, Linville Ridge, Leatherwood Mountains Resort, Westglow, Jonathan Burton, Matt Powell, Wayfaring Wanderer, Ellen Gwin, Life Stage Films, Fuchsia Moss, Root and Vine Design, Snow In July, Elizabeth Hempfling, The Whole Shebang, The Gamekeeper, Reid’s, Casa Rustica, Beautiful Bride, Nelson Garcia, Haircut 101. What do you like about working with Wayfaring Wanderer? Sunday, March 20th @ the Boone Mall from 1pm-4pm for the High South Wedding Expo. What a fun thing to do at a wedding! A photo booth! It’s such a blast! I love photographing weddings that have a photo booth because it makes it way more fun! ? ?